This jack pressure filter uses screw jack closed system. It is the characteristic of simple in structure, convenient in operation, no power consumption, cost savings. 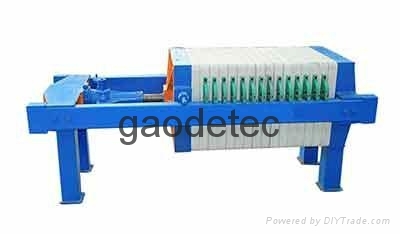 Because it is a small filter device, usually with 1-40 m2 filter press filter area. This manual and filter pattern can be widely used in chemical industry, all kinds of oil filter syrup, sludge filtration, etc. At the same time, the body will be painted a layer of PP material requirements. If you want more information, please contact us: info@gaodetec.com. Thank you very much!